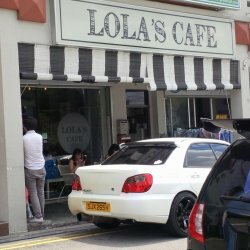 Finally, after three unsuccesful tries, I managed to have brunch at the ever-popular Lola's Cafe. With all the fuss and raves, I was very much looking forward, and in the process got the beautiful *Lara excited as well. A very small cafe with millimetres of table space apart and an array of desserts on display at the counter, it was crowded as usual. Thank god for reservations - I like their reservations system actually - complete with followup SMS text notification and an automated call reminder on the day itself. 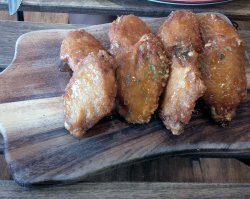 As for food, we began with their signature Honey Paprika Crispy Wings (SGD$10.00) - tasted yes, sweetness of the honeyed marination, but where was the crisp? Chicken was tender enough but there was no wow-factor at all. 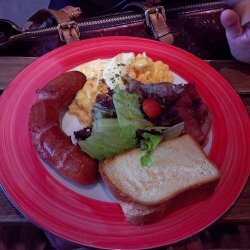 Then Lara's brunch set came - Lola's Full Monty Breakfast (SGD$15.00) - comprising of Brioche bread, pork sausage, honey bacon, pork ham, scrambled eggs, and garden salad with Balsamic dressing. It was served on a rather .....unpresentable plate and the verdict was an average at best. The bread was just your normal loafed bread, and the sausage was thick & limber in texture. 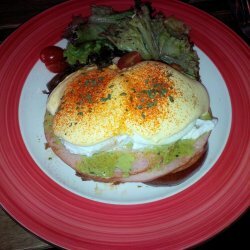 I had the Avocado Eggs Benedict (SGD$15.00), served on the same kind of plate but with better arrangement, consisting of Brioche bread, avocado, poached eggs, pork ham, Hollandaise sauce and garden salad with Balsamic dressing. I could probably make this for half the price - but having thought that, this also means that this brunch set has a very wholesome, homely touch to it. The avocado was a little sad though - scrapes of avocado paste that contributed zilch to taste or texture.